Google Allo, a messaging app announced at Google I/O on May 18, 2016, alongside video calling App Duo, is now official. For many, chat apps might not sound like something new. Hangouts, Skype, FaceTime, Facebook Messenger, WhatsApp messenger etc, has been meeting all messaging needs with friends and loved once but what is Allo bringing to the table? Google Allo does the things you expect from a messaging app: sends pictures, lets you share fun stickers, works for group chats, and so on. The something special that could make users switch away from those other apps, that could give Google an advantage is Google. Or more specifically, the new Google Assistant, which leverages Google’s machine learning capabilities to answer your questions. Featuring a preview edition of Google Assistant — what might be the smartest of all smart bots –, makes it a smarter messaging app like no other. Let’s taking a more detail look at the new Google Allo. 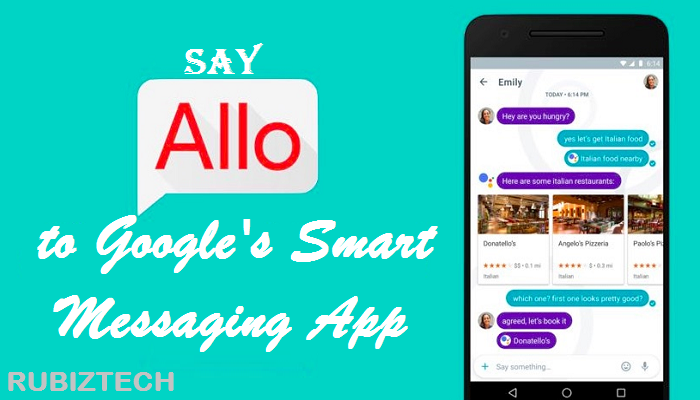 There are several interesting features that are worth noting on Google Allo messaging App and we have listed them below. Unlike most Google’s applications, you will be required to sign-up using a Google Gmail account. But not so with Google Allo app. Duo allows you sign up with just your phone number. Once you install it, you’ll receive a verification code via SMS to ensure that it’s actually you that’s signing in. However, you can’t use two phones at the same time to chat with Allow messaging app. Each time you log back in on another phone, you’ll have to re-verify, just as you do on WhatsApp. It really feels like it was designed for a single mobile phone at a time. You can associate your Allo account with your main Google ID or keep it separate if you’d prefer that. Though a cross-platform app, it is only available for Android and iOS devices. This is because they are the most used mobile operating systems. So, BB10, Windows, OS X, or Chrome OS users may not have a taste of Google’s new messaging app, Allo. Google says it will look to expand Allo to other platforms eventually. Allo also doesn’t have any contact lists for you to maintain. It just piggybacks off your phone’s main contacts app. If your contact has Allo installed, they’ll show up on top. If they’re on an iPhone, they’ll receive an SMS with your name, the contents of your message, and a link to download the app. They can then download it or — if they want — just reply via SMS. Google has set up a full SMS relay so that your recalcitrant friends can avoid installing it at all if they don’t want to. If they’re on an Android phone, something new and intriguing happens. Google is calling it an “app preview notification,” and basically it shoots a notification directly to your Android device instead of going through SMS. Your friend will get a notification that looks and acts almost as if they had the app installed in the first place, message content and all. It means they won’t incur any SMS fees, either. Your recipient can reply within the notification, or tap on it to install the app. Respond to messages without typing a single word. Smart Reply learns over time and suggests responses to text and photos, in your style. Whether you’re a ‘LOL’ or ‘hahaha’ kind of person, Smart Reply will improve over time and adjust to your conversation style. Smart reply will also suggest responses to photos sent in Allo, so if your friends send a picture of their dog, or cat, or cute kid, you might see suggestions like “aww, cute!” or “nice dog!”. Get creative with the photos you send by doodling on them or adding text. Chat just wouldn’t be chat if it was text only – in Allo you can make text or emojis bigger or smaller by dragging the ‘send’ button up or down, scribble on photos before you send them. Say it all with the perfect sticker. This allows you to add custom stickers designed by independent artists and studios around the globe that Google has partnered to create custom sticker packs, because sometimes what you really, really need is a ‘sloth riding a pizza’ sticker. Allo is available globally in app stores from today and you can now pre-register.